The Vosges mountains in Eastern France separate the Lorraine region from the Alsace region which is famous for its white wine and where traditionally a Germanic dialect, "Elsässisch", is spoken. Though not very high, the Vosges mountains always have been an obstacle to through traffic, and railway lines which crossed them were built late and proved inefficient. An obvious exception to this statement is the Paris - Strasbourg main line which opened its final section between Sarrebourg and Strasbourg in 1851. The reason for the Trans-Vosges lines to be built - if ever so - only in this century is that Alsace was part of the German empire between 1871 and 1918. Therefore, during a large part of the railways' "Golden Age", no serious attempt was made to complete these through lines. However, a lot of branch lines were laid in the Vosges valleys on both sides of the mountain chain, these being built with standard as well as narrow gauge. Most of these branch lines - and particularly those on the Alsatian side of the montains - are said to have been built for strategic purposes, but also provided the region with rather good non-military transport facilities. 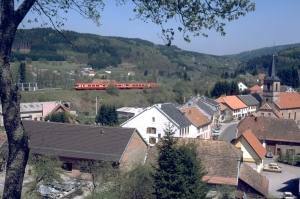 While the narrow gauge lines - for example, the "Kayserberger Thal-Bahn" which ran from Colmar to Kaysersberg and Lapoutroie - have long been abandoned, standard gauge lines survived much longer, and fortunately some of them are still in service, offering railway enthusiasts and photographers a lot of branch line traffic in a wonderful scenic setting. Some of these standard gauge branch lines are now described more in detail. 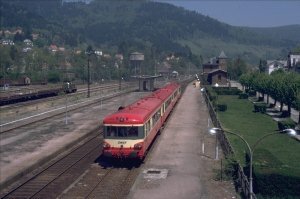 The Bruche line, running from Strasbourg in Alsace to Saint-Dié in Lorraine, is the only Trans-Vosges line (apart from the Paris-Strasbourg main line) that is still in use. 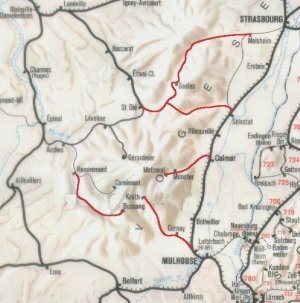 Its first section from Strasbourg to Molsheim and Mutzig was opened as a purely local line (chemin de fer vicinal) in 1864, but the following 23 km section climbing further south to Schirmeck and Rothau (which despite their names are traditionally French-speaking towns) opened in 1877 only. At that time the whole branch had been incorporated into the "Reichseisenbahnen Elsaß-Lothringen" (EL) network. It was also EL who built the subsequent 16,5 km section Rothau-Saales (opened in 1890) as a typical local railway, laid in tramway-like manner alongside the existing roads. With Germany defeated at the end of World War I, Alsace and its railway network came back to France, and EL became "Chemins de Fer d’Alsace-Lorraine" (AL). Soon after that date, serious steps towards the construction of "real" Trans-Vosges railway links are taken, including a 41 km line from Saales to Saint-Dié. The former local "tramway-style" line Rothau-Saales is completely reconstructed, while the Strasbourg-Molsheim-Rothau section is partly rebuilt but entirely equipped with double track. The whole Strasbourg-Saint-Dié link is open in 1930. Some years later, another Lorraine-Alsace rail link comes into being between Saint-Dié and Séléstat. This is achieved by linking Lesseux-Frapelle station, on the Saint-Dié - Saales section, to Sainte-Marie-aux-Mines, endpoint of a local branch line from Séléstat opened in 1864. Whereas the Bruche line passes over the Vosges mountains by climbing up to the Col de Saales (which is only 550 m over sea level), the Lesseux – Sainte-Marie link passes through a base tunnel which is 6874 m long and therefore was the longest tunnel entirely situated on French territory. The Lesseux-Sainte Marie line was opened in 1937, allowing for Nancy-Colmar direct trains. At that time, French railways were nationalised, SNCF taking over all AL lines. SNCF showed little interest in developing the Saint Dié-Séléstat line and, in 1973 and thus only 36 years after its opening, the Lesseux-Sainte Marie section is closed. The 6,8 km railway tunnel was rapidly rebuilt for road traffic and reopened as a toll tunnel in 1976 – an example of short-sightedness in transportation matters hard to believe! 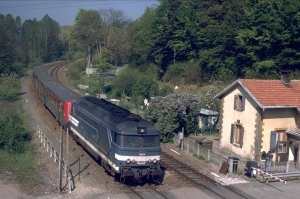 (Passenger service between Séléstat and Sainte-Marie-aux-Mines lingered on until early 1980; during the 80's freight service was cut back to La Vancelle station where an important industrial plant is located.) The Saint-Dié – Strasbourg line, however, remains open though traffic today is purely regional, with EAD railcars and modernised BB-67000 hauled push-pull units dominating the scene for many years. New TER X 73500 railcars should enter in service on the Bruche line soon. Railway photographers will find plenty of wonderful spots on the entire Molsheim to Saint-Dié section and will most probably regret that there aren’t more trains to photograph. Actually, the current timetable isn’t that bad (at least in comparison to other French regional lines), with 13 weekday pairs of trains between Strasbourg and Rothau, 8 between Rothau and Saales and 5 between Saales and Saint-Dié (1999 timetable; table 122 in the SNCF National Timetable books). Unfortunately, locomotives on the push-pull units are always on the Strasbourg end of the train, making good photographs difficult except for some northern sections of the line during morning hours. As far as I know, freight traffic is not very heavy and freight trains only run occasionally on the Molsheim-Saint Dié section. Station buildings are of different styles on the Molsheim - Saint-Dié section. Some of them, such as Mutzig, Schirmeck and Rothau, were built in a rather "Germanic" style using red sandstone which is so typical for the northern Vosges. Those buildings that were erected in the 1920's (i.e. all between Saint-Dié and Saales and most of those located on the rebuilt sections of Saales - Rothau) are beautifully designed and differ a lot from "standard" French railway buildings. Molsheim once probably was the most interesting station in Alsace: being at the intersection of the Strasbourg - Saint-Dié and the Séléstat - Saverne "piedmont" line (which nowadays is still active - and even very active - for passenger and freight service on the southern section between Molsheim and Séléstat), it had two distinct parts situated next to each other but on different height levels. There were multiple station buildings, some of them dating back to the original local railway period. Until the 80's, mechanic "AL-style" signals (resembling German models) were used. All this is now gone, with Molsheim station completely modernized, but it is still a very busy place that is worth a stopover. On the southern slope of the Saales pass, there is a 220° horseshoe curve near the villages of Lubine and Colroy-la-Grande, but this is difficult to get into a picture. Now let's turn over to the Upper Moselle line.